Columbia SC, the capitol city, features some amazing southern cuisine. If you’re looking for haute cuisine, you may have to keep looking, but if you love that Paula Deen style of southern cooking, look no further: You’re home! Here are 5 of the best restaurant experiences Columbia has to offer. Yesterdays Restaurant and Tavern is located on Devine Street in the Five Points area. Yesterdays is well known to the college student looking for a meal to remind them of home as well as every other person living within a twenty mile radius of Five Points. Easy to spot due to the life size cowboy mannequin perched in a bathtub over the entrance, the distinctive flat-iron shaped building is home to some great southern specialties.Once inside, the atmosphere is homey yet upbeat. Serving fresh homemade southern dishes like meatloaf and chicken fried steak, the menu is varied enough to offer something for everyone. There are a couple of nightly specials as well (like catfish Tuesdays), so check the board when you come in. Prices are reasonable while the amount of food is plentiful: Yesterdays offers the right blend of sassy Southern attitude coupled with darn good food. You can’t go wrong with this place. The No Name Deli is located on the corner of Marion and Elmwood. Even if you are looking for it, you may drive right by No Name without noticing it the first time around. Once you’ve spotted it, don’t get worried about the lack of parking: There are plenty of metered spaces around the block, and a space will come open within moments during lunch time. No Name’s main clientele consists of area business execs, lawyers, and everyone who works anywhere nearby. Don’t be discouraged by the line when you step in the door: This lunch line moves FAST, and you will be asked within moments what you want for lunch. Read the menu quickly, because the pressure is on once you reach the counter, where the staff will prepare your sandwich or salad while you watch. Don’t expect to pay with a credit card, because they only accept cash or check. The Reuben is a favorite choice, although your mouth will start watering the moment you hit the doorway and smell the burgers! The taco salad is an experience in itself, featuring homemade chili ladled over a mixed green salad, topped with shredded cheese and sour cream. No matter what you choose, be sure to try the special raspberry tea. Copper River Grill is located on Bower Parkway, near the popular Columbiana Grande movie theater complex. Copper River Grill is designed to give the impression of hanging out in an Alaskan lodge: There’s a big stone fireplace, lots of copper accents, especially over the bar area, and a big open view show kitchen. Copper River Grill has a huge wood fired grill, so the pizza here is amazing. The house salad with the house dressing is not to be missed: Imagine combining a bowl of hot bacon drippings and honey mustard dressing and then pouring it over a huge bed of mixed greens, bacon, almonds, cucumbers and tomatoes…wow! And every salad is served with a warm croissant drizzled with light white icing that is so good you’ll want to order a plateful. The wait staff here is really top notch and the chefs are on top of things too. Well worth the price, you won’t leave here hungry. DO NOT LEAVE without eating the house salad! This restaurant caters to young professionals, families, college co-eds and couples looking for a nice casual dining experience. Copper River Grill is suitable for any occasion and all diners. Motor Supply Company Bistro, illuminated by a bright neon sign declaring its origins, is located in the heart of the Vista district. If you are looking for a restaurant that features a progressive menu with a distinct southern flair, you definitely want to check out Motor Supply. The chef changes the menu twice daily, providing a unique dining experience for each service. The menu is available online half an hour before service begins, giving you the opportunity to choose a lunch or dinner visit to sample a meal that piques your culinary curiosity. With such mouth-watering specials as Charleston Dayboat Wreckfish served with fennel and vermouth cream or pan seared veal chop topped with shiitake demi-glace, you are assured of experiencing a culinary adventure you won’t soon forget. Motor Supply maintains an extensive wine list, and their servers are adept at suggesting great wine pairings for your dinner selection. The chef at Motor Supply makes a conscious effort to choose self-sustainable foods, sourced locally when possible, in order to benefit local farmers and provide the freshest product available to diners. Consider getting a seat at their beautiful outdoor terrace on a cool summer night and prepare yourself for a refreshing dining experience you will want to encounter again and again. And with the ever-changing menu at Motor Supply, you will never have the same experience twice. Blue Marlin/Steaks and Seafood is found in the popular Vista district in Columbia, where they serve delicious low country seafood dishes. Repeat customers are the mainstay of this successful restaurant, and although it is located near USC Columbia, Blue Marlin tends to draw families and business travelers. Don’t miss their fried green tomato appetizer unless you opt to try the crab cakes! 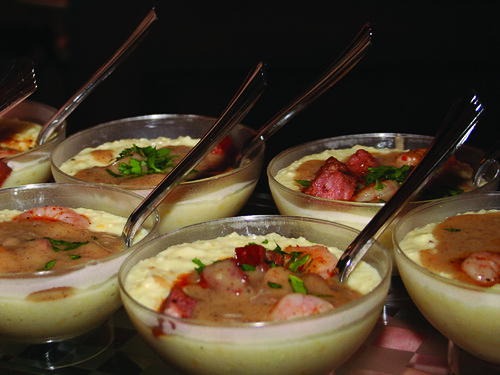 The restaurant’s signature dish, low country shrimp & grits, are legendary. This is a great place to find seafood, and lots of it. They also serve killer hand cut steaks. Blue Marlin is a great place for diners seeking authentic Southern seafood. From a hole-in-the-wall deli with no name to an eclectic electric bistro, Columbia has some great restaurant options for your consideration. Don’t miss out on all the fabulous southern specialties Columbia has to offer! We take the pain out of planning your family vacation by helping you discover what's great in your destination and providing coupons to keep it affordable.